The 74th Ranji Trophy promises to be one of the most unpredictable, what with many strong teams left depleted after the exodus to the Indian Cricket League (ICL). Away from the glare of Twenty20 heroics and the resultant media frenzy, a slew of first class cricketers all over the country will now be touching their cricket kit with an air of reverence. The Ranji season is about to unfold and players will represent the various States in near empty stadiums, with just their team-mates, cricket writers, a few hangers on and may be the odd stray dog for company. It is a lonely path but one that promises a national cap provided you can pile a mountain of runs or grab a flurry of wickets. For veterans it is about proving they still have some cricket left in them besides donning the elder statesman’s role.There are fifteen teams in the super league which have been divided into two groups of eight and seven teams respectively for the coming competitions. Group A : Mumbai Karnataka Tamilnadu Delhi Himachal pradesh Saurastra Maharashtra,and Rajasthan. Group B: Orissa Uttar Pradesh Punjab Andhra Pradesh Bengal Baroda, and Hyderabad Mumbai: Railways, the 2004-05 champions, are currently languishing in the Plate League; UP, their successors, just about avoided relegation last season. Mumbai, defending champions this year, would look to undo the dubious trend prevalent over the last two years: of champions losing their form completely. Mumbai have already played two matches this season, beating Karachi Urban in the Mohammad Nissar Trophy, but losing outright to Rest of India in the Irani Trophy. On display were flashes of exciting new talent but also some phases of ordinary play. They are one of the few teams who haven't lost any significant players to ICL. To add to the already existing pool, they have, among others, Ajinkya Rahane, the aggressive opener who scored century on debut and also played the Challengers and Iqbal Abdula, the 17-year-old left-arm spinner who can add up as a handy lower-order batsman. Ajit Agarkar and Ramesh Powar may play more of a role this season, given they both find themselves out of the Indian team currently. A glaring omission is left-arm spinner Nilesh Kulkarni, who was the leading wicket-taker for Mumbai last season, with 24 wickets at 20.79. There were rumours that he might join ICL, but that did not eventually happen. They go into the Ranji Trophy a solid team, playing four out of their seven games at home - including the last one, against Saurashtra. Complete Mumbai squad What they did last season The unthinkable many times over. Going into their fourth match, they didn't have a single point and relegation loomed large over the the side that has won the trophy 36 times. But Gujarat and Rajasthan got a taste of vintage Mumbai cricket in the next two games as they both lost by an innings each, and Mumbai were alive and kicking again. Needing a win with a bonus point in the last match, they travelled to Nasik to play Maharashtra, the younger brother who had managed to beat them in the previous season. Beating Maharashtra by an innings and 154 runs, Mumbai reached the semi-finals with serious momentum. Just when it seemed they would steamroll any opposition, they found themselves down at 0 for 5, after having secured a first-innings lead against Baroda. That's when veteran wicketkeeper Vinayak Samant came up with a desperate knock of 66, and put up a respectable challenge for Baroda. Their inexperienced bowling line-up then bowled Baroda out for 173 to make it to the finals. With Sachin Tendulkar, Wasim Jaffer, Zaheer Khan, Ajit Agarkar and Ramesh Powar playing in the final, Bengal were always up against it. Amol Muzumdar was eighth on the run-getters list and Rohit Sharma 12th, both managing more than 500 runs each, with their averages in the high forties. Men to watch Their triumph last season was an ultimate team effort: whenever they found themselves in a hole, one or the other player raised his hand. As a team they look solid this season too, but there are certain individuals who have promised a lot over the last year. Abhishek Nayar, who has two breezy centuries this season already, promises to develop into an aggressive No. 6 and a stable medium-pacer. Abdulla has been given a huge mantle: one to replace Kulkarni and if Powar is out on national duty, he will have to take the lead spinner's role. Rahane and Sahil Kukreja have shown the makings of an effective opening partnership: 381 runs in three innings they have played together. It looks as if Mumbai will be the team to watch out for even this time. Delhi Virender Sehwag and Aakash Chopra, if not on national duty, will be key players for Delhi Â© AFP Delhi are a side in desperate need of a boost. Over the last two years, Delhi cricket has lost more than 10 cricketers - and coaches KP Bhaskar and Gursharan Singh - owing mainly to lack of opportunity and financial instability. Now, under the guidance of coach Vijay Dahiya and bowling coach Manoj Prabhakar, Delhi have stuck to the 'old is gold' truism. Virender Sehwag has been named captain, though his recall to the national side means a veteran like Mithun Manhas might now have to lead the side. Gautam Gambhir, and perhaps Ishant Sharma, are also uncertain to play. A one-month pre-season camp didn't throw up any exciting talent and even the fringe players have been in and out of the team. Dahiya hopes to play all Delhi's home matches on result-oriented pitches; he has identified that as a decisive factor in achieving outright victories. Delhi open their Ranji campaign at home against Rajasthan, a side with two talented medium-pacers, Pankaj Singh and Sanjay Gill. They play in the same group as champions Mumbai and semi-finalists Karnataka. They play only two of their seven games at home. Complete Delhi Squad What they did last season Delhi finished the 2006-07 third in their group, but with only one outright win from seven games. They took two points from their opening draw against Tami Nadu, batting out the final day on a lifeless Kotla pitch, and two more from a fog-hit game against UP. The trend continued until Saurashtra thumped them by 10 wickets in Rajkot. Next, they snuck a four-run draw against Andhra, picking up two more first-innings points. They won their last game against Haryana by an innings and 18 runs, but it was too late by then. Rajat Bhatia was Delhi's leading scorer with 512 at 64, but finished 14th on the overall list. Ishant Sharma picked up 29 wickets at 20.10, one of the reasons he made it to the Indian side. It was a better season than the previous, as 10 centurions compared to two indicates. Men to watch Aakash Chopra has been in fine form - even being discussed in hushed tones for an India recall. His consistency last season was rewarded with selection for India A against South Africa A in September. He scored an unbeaten 239 in a big victory, and was also handed a newly conceptualised D-category central contract by the BCCI. How well he bats is sure to have an impact on Delhi's showing. Shikhar Dhawan is another fine batsman who has captained Delhi in the limited-overs format and runs from him would be a boon. I'd add Ishant Sharma, Virat Kohli and Rajat Bhatia also in the men to watch list. DDCA in utter mess The senior selection committee of the Delhi and District Cricket Association (DDCA) released the list of probables for the forthcoming Ranji season on Tuesday. And true to DDCA form, the list contained a massive 51 names, probably, as one member said, to accommodateâ€ players who wanted to have that â€œDelhi Ranji probableâ€ tag. The list will subsequently be pruned to 25 after a five-day camp, and then to 16. The camp begins at the St.Stephen's college grounds on September 10. While Virender Sehwag has been appointed skipper and Gautam Gambhir his deputy, it remains to be seen who leads the team if and when both are on national duty. Justifying the big list, chairman of selectors, Chetan Chauhan, said: â€œWe wanted to make sure no player misses out. We wanted to give everybody a chance.â€ Chauhan added that the committee had decided to set an aggregate of 700 runs in the local leagues as the minimum requirement for batsmen and 30 wickets for the bowlers. As for all-rounders, the criteria was 400 runs and 20 wickets. â€œNine players have been selected (from the leagues) on this basis,â€ Chauhan said. The rest are various state-level players. The 51-name list clearly has an emphasis on pace, something Chauhan revealed, was done at Sehwag's behest. â€œSehwag wanted a large pool of pacers to choose from; when we prune the list, we will have about 4-5 extra pacers to distribute the workload,â€ Chauhan said. As for the list, while 15 pick themselves, there are the all-too-familiar â€˜quotaâ€™ names. Sources told HT that several DDCA officials were less than happy with the size of the list and the obvious favouritism. An interesting name on the list is that of fast bowler Sanjay Gill. Gill, who has played for Delhi, and turned out for Rajasthan a couple of seasons ago, took a No Objection Certificate (NOC) from Rajasthan and is now set for a Delhi 'comeback' at 32-plus. Better late than never. But the list of 15 players have been finalised! Finally! It'll also be interestingto which kind of pitch will be provided at Kotla. Will it be a green-top like in this match or will it be the usual slow Kotla track!! I would Varun. That'll be very nice and many of the forummers who don't take much interest in the domestic cricket might get interested! Good point. Let me see what I can do. Is anyone here regular Ranji watchers ? Sriram - (if you are in India) do you go to MAC ? Ok, SUPERSELECTOR FOR RANJI SUPER LEAGUE IS UP !! However, PLEASE double check all the players that they have been correctly bracketed as an allrounder/batsman/bowler/keeper... Thing is because of defections to ICL, there are loads of fresh faces, and I'm not that big of a domestic cricket follower to know all the new guys (also some of the older ones) So please let me know which ones are wrong before you select your team. Tamil Nadu Tamil Nadu were a team in transition in the 2006-07 season, as the results reflected. They only narrowly avoided relegation, winning just one of their seven matches outright. But to judge them by results alone would be taking things out of context. Through the course of the season Tamil Nadu, under a new coach in WV Raman, blooded youngsters, and tried to build a settled team. The concerns for Tamil Nadu were two fold. Firstly, the batsmen were not putting enough runs on the board, and when they did so they didn't score quickly enough to retain the initiative. Secondly they lacked an experienced, quality spinner. The medium-pace department was fairly well stocked and the opening batsmen, M Vijay and S Anirudha, settled down well as the season unfolded. Tamil Nadu were also hurt by the absence of S Badrinath and Dinesh Karthik, away playing for India A or India at various times in the season. Neither played a major role in the highlight of Tamil Nadu's season, which came in the inaugural Inter-State Twenty20 championships. Tamil Nadu played smart cricket, using several cricketers who were not necessarily part of their first-class set-up and beat more fancied sides to reach the final, where they edged out Punjab in a thriller. Finally they had a national trophy in the silverware cabinet. The one big worry for the coming season is the loss of D Tamilkumaran to the Indian Cricket League (ICL). Tamilkumaran led the attack and in the absence of L Balaji, who is still in the process of recovery and rehabilitation, Tamil Nadu's pace attack is weakened. Balaji, though not picked in the side initially, could be match fit by around the third match of the season. This season, they will have the advantage of playing all their games at home. Badrinath to lead young Tamil Nadu S Badrinath has been retained as Tamil Nadu's captain for the coming Ranji season. Apart from Badrinath and Dinesh Karthik, Tamil Nadu will have a largely inexperienced squad, with only five players who have played more than 10 first-class matches. L Balaji, the former Test medium-fast bowler, has been left out of the squad that was picked for the first two matches. The management plans to ease him back into competitive cricket as the season progresses. Even among the experienced players, Badrinath, Karthik and Yo Mahesh will be the first targets for India A teams, if not the national team in the case of the former two. Offspinner R Ashwin, who has taken 34 wickets in the five matches he has played, might be the one to lead in their absence. In the absence of T Kumaran, who was one of the seven players to have joined the Indian Cricket League (ICL), the pace attack will have to be spearheaded by Mahesh. C Ganapathy, the right-arm medium-pacer and Ramadoss Naresh, the left-arm medium-pacer, are the two other experienced pacers. Murali Vijay, the right-hand opener, who impressed in his debut season last year, will be the main hope in the batting department, along with Badrinath, Karthik and S Anirudha, who played in the Challenger Trophy. Complete Squad: S Badrinath (capt), M Vijay, S Anirudha, Dinesh Karthik, Kuthethurshri Vasudevadas, R Prasanna, R Ashwin, C Ganapathy, V Yo Mahesh, R Naresh, R Srinivasan, P Amarnath, R Ramkumar, Abhinav Mukund and KH Gopinath What they did last season After kicking off the season with a lifeless draw on a dead pitch at the Feroz Shah Kotla against Delhi, Tamil Nadu drew a game they should have won, against Andhra. Tamil Nadu scored 474 and then bowled Andhra out for only 155. But, after being asked to follow-on, Andhra held on to 327 for 8, denying Tamil Nadu an outright win. Through the season the failure to close out this match would hurt Tamil Nadu. Then there were points gained from a high-scoring draw against Saurashtra, and the advantage conceded in a draw against Uttar Pradesh. An outright loss to Karnataka, by 10 wickets was just about salvaged with a win against Baroda in Tamil Nadu's last match of the season. Men to watch M Vijay had the kind of season that should have pitchforked him to higher honours. With runs in all forms of the game - grinding, stable knocks in first-class cricket that brought 628 runs from 7 matches at 52.33 and freer, clean hitting in limited-overs matches - he should have been a shoo-in for India A selection. Yet somehow he was ignored all season. Vijay possesses a tight technique and a sound temperament, and has shown the ability to switch gears to suit different circumstances. His opening partner, S Anirudha, has the ability to hit the ball as cleanly as anyone in domestic cricket. If he reins in his tendency to have a go at everything on offer, Anirudha could well be a key component in Tamil Nadu's campaign. R Ashwin began as a batsman, but ended up being the top wicket-taker for Tamil Nadu by taking 31 wickets with his canny offspin, at an average of 16.93. A steady batsman in the lower order, Ashwin has proved to be an attacking and imaginative captain when afforded the chance to lead the side. Bengal Despite two amazing seasons, Bengal are without any trophies and they must be wondering what more they need to do. This season, they face a hard task of picking themselves up after two of their most experienced players - Deep Dasgupta and Rohan Gavaskar along with many others - have defected to the Indian Cricket League (ICL). They have made it to two finals in a row, but somehow managed to stumble at the last hurdle and had Dasgupta and Gavaskar still been with the team, they would have been strong favourites to go the distance again. Allrounder Laxmi Ratan Shukla, vice-captain last season, has been appointed the captain of the side after he decided to not join the ICL. Shukla, averaging only 32 in first-class cricket, will be looking to make a statement both as a leader and as a batsman. But the major batting attraction once again will be Manoj Tiwary, second in the overall run-getters' list last season. He was unfortunate in getting injured just before what could have been his ODI debut, but is back among the runs after a shoulder injury. Apart from Dasgupta and Gavaskar, Abhishek Jhunjhunwala and Subhomoy Das are their big batting losses to the ICL. There is good news though: SS Paul, their leading bowler in 2005-06, is back to full fitness after he missed the whole last season with a knee injury. Along with Ranadeb Bose, the highest wicket-taker last season, vice-captain Saurashish Lahiri and Sourav Sarkar, Bengal can still boast of the most solid bowling attack in the country. With five of their six matches to be played at home, they should be backing themselves to make it to the knockout stage third time running. 'I am ready for captaincy' - Shukla Laxmi Ratan Shukla made his international debut at a time no India player remotely resembled an allrounder. But after three ODIs in 1999, he was dropped and has never again played for the national side. Since then he has been an important member of the Bengal team. He drifted for a while before the start of the season, but chose against joining the Indian Cricket League (ICL) and has now been rewarded with the captaincy of the Bengal side. He spoke to Cricinfo about his career and his team's prospects going into the season. Shukla: "Our supply line is still good [even after the exodus to ICL]. I just expect to carry on with the good work that Deep Dasgupta has done. But the target will be to take it a step higher" Â© Cricinfo Ltd It's close to 10 years for you in first-class cricket. What changes have you seen? Cricket wasn't as mobilised as it is now in terms of training and the availability of a physio. The game has come a long way since then. Every year, there are innovations. If we talk of facilities available today, it doesn't look like the game from ten years back. Comparing then and now will be illogical. We now have a support staff with a physio, a trainer, a computer analyst and a video analyst. Quality-wise, it has improved, but not to the extent it should have, given the facilities. It is not as competitive now as when we started out. I also feel that the seniors are being ignored a bit. Looking back, do you think your chance at the international level came a bit too soon? I don't think so. I had performed well enough to deserve that chance. But do you think you would have been a more mature player had you debuted a year or two later? It was not in my hands. If somebody selects you, he does it depending only on your performance. It's difficult to say, but yes I have matured as a player over the years. What made you join ICL and then come back? Actually, not many know that I had gone there [to Mumbai where the ICL paraded around 50 recruits, Shukla being one of whom] just to talk to More sir [Kiran More] and understand the concept. I didn't go there to join, and I didn't know there would be a public gathering. It all happened too fast. But I hadn't signed the contract by then. Later, although the offer was good , I didn't feel comfortable leaving Bengal and playing for ICL. Bengal have had two good seasons, but all of a sudden many players have left to join the ICL. What are your expectations going into the season, now that you are the captain too? Our supply line is still good. Obviously we will miss Deep [Dasgupta, their captain over the last two seasons] and Rohan [Gavaskar] a lot, but we are not worrying about the others because we have players who are just as talented. Deep is a good friend and when he was the captain, I was the vice-captain. I just expect to carry on with the good work that he has done. We will try to maintain that level, but the target will be to take it a step higher. What was your first reaction when you saw the team at hand? We have been together for quite a bit now. I like what we have, and when we went to play in Hyderabad and Bangalore, the boys who got the chance showed they have talent. What they were lacking was getting chances, which they will get now. The it's up to them to prove they deserve the chance, especially when they will be playing in place of such dominant players like Rohan and Deep. Nobody can be replaced completely, and it would be wrong to compare new players to anybody. But what they can do is show that they too can succeed at this level. How disappointing was it for the team to lose two finals in a row? It was very disappointing to reach two finals in a row, and still not win. To motivate the team after losing the finals was very difficult, because we played good cricket consistently. It will be difficult to pick ourselves up, especially this year, playing without Rohan and Deep. You will be without Paras Mhambrey who coached you guys last two season. Paras bhai was outstanding over the last two years. He did a lot of good work with us. We will miss him a lot, but things don't come to a halt when an individual leaves. We can only look forward. Bharat Arun [the current coach] is doing a good job. He treats everyone equally and doesn't have favourites. There has been this criticism against you that have not matured as a batsman, that you are still a bit careless. Do you think a first-class average of 32.59 is an underachievement? See, one can always do better. But you have to see my position in the batting order too: it's mostly at No. 7. Most of the times, I only get to bat with the bowlers. But yes there is always scope for development. Your bowling will be boosted by the return of SS Paul. He is bowling well, is looking good, and has recovered from the knee injury that kept him out last season. You could play carefree cricket before, but now that you are the captain, how is this season different on that count? There is extra responsibility, it will be more fun. I have played for close to 10 years and I am ready for captaincy. Fitness & fielding: Bengal’s new mantra Complete Bengal squad What they did last season Bengal's performance last season was an almost perfect mix of efficiency and flair: while Bose never let them miss Paul, with consistent and stable medium-pace bowling, Tiwary led the batting in typical aggressive style. Sourav Ganguly put in his cameos whenever he was available to play. They were almost perfect because they fell at the last hurdle: unable to overcome a strong and star-studded Mumbai side. They also showed resilience when in an away game they rolled Hyderabad over for 76 after having fallen behind by 109 in the first innings. They led their pool with 17 points from three outright wins and two first-innings leads. Bose and Tiwary led the statistics and they were solid until the finals. Men to watch Tiwary, Bose and Paul would want to continue from where they finished off last season. Tiwary with 796 runs at 99.50, Bose with 57 wickets at 14.22 and Paul with 36 wickets at 25.38 in the previous season; came close to national selection, but face a fresh domestic season ahead. Tiwary still stands with a realistic chance for a call-up anytime, while for Bose and Paul it is another opportunity to put up a statement. Great work, chandan & varun. Varun, in Ranji trophy super selector.. i se restriction of players from each team.. u can pick just one from each team... and i notice it sayz 16 man squad.. and only 14 teamz available... yaar kamsekam 2 yaa 3 players max per team karle..
ANDHRA PRADESH A fourth place in Group A last season showed that Andhra were no pushovers. The team rode on the performances of bowling allrounder Syed Sahabuddin, mediumpacer D Kalyankrishna and batsman Prasad Reddy. However, the nucleus of the side has been jolted with the transfer of captain Venugopal Rao to Maharashtra and Sahabuddin's loss to the ICL. MSK Prasad, the former Indian wicketkeeper, is the most familiar name in the squad and he takes over the captaincy as well. A few players in the squad have little or no first-class experience, so the challenge for Andhra would be to keep their head above water against Punjab, Uttar Pradesh, Hyderabad and Bengal. MSK Prasad to lead Andhra MSK Prasad, the former India wicketkeeper, will lead a 15-member Andhra Ranji squad to take part in the Ranji Trophy Super League. Prasad was made captain after former captain Venugopala Rao shifted allegiance to Maharashtra. The team will also be without the services of KS Sahabuddin, who signed up with the Indian Cricket League. The player to watch out for will be Bodipati Sumanth, the former India Under-19 batsman, who impressed on the U-19 team's tour to England in 2006. He scored an unbeaten 97 in the third one-dayer in Cardiff. Sumanth has played three first-class and five domestic Twenty20 matches for his state. The squad will be coached by former Test player, Syed Abid Ali, who had guided Andhra to the top of the South Zone in 2002-03, when the Ranji Trophy was zone-based. The squad's 20-day conditioning camp in Visakhapatnam ends on 30th October. Complete Andhra squad: MSK Prasad (capt, wk), Arjun Kumar, Mohammad Faiq, Gnaneswara Rao, Doddapaneni Kalyankrishna, I Raju, Prasad Reddy, Reddy, V Sandeep, Shankara Rao, Bodapati Sumanth, Marripuri Suresh, Satya Kumar Varma, P Vijay Kumar, Hemal Watekar Coach: Syed Abid Ali What they did last season The season began on a high as Sahabuddin and Kalyankrishna took centrestage in a low-scoring game in Rohtak, a match otherwise known for Joginder Sharma's hat-trick. Following that 114-run win was a back-to-the-wall draw against Tamil Nadu, thanks to Rao's unbeaten 105, which saved the team from a likely innings defeat after being asked to follow on. Sahabuddin ripped Saurashtra apart with a seven-wicket haul in the third match and their 78-run win in a low-scorer saw them rise to the second spot in the points table at that stage. Three draws followed, but there was no shortage of excitement. Karnataka managed to hang on with three second-innings wickets in hand, but bigger thrills were in store against Delhi in Vijayawada. Sahabuddin's 95 took Andhra within touching distance of the target of 333, eventually falling short by four runs with just one wicket in hand. Staring at a certain defeat at 144 for 6, Sahabuddin shepherded the tail and made a fist of the target, with Kalyankrishna for company. Their final game, against Uttar Pradesh was a disappointment and they had their batting entirely to blame in an innings defeat. Sahabuddin - with 28 wickets - was the stand-out performer for his all-round efforts, and his absence will be felt this season. Men to watch Reddy, who topped the run charts with 552, will be expected to shoulder the batting responsibilities with Prasad, in the absence of Rao. Batsman Bodapati Sumanth, who toured England with the Under-19 squad last year, will look to make an impression after only three first-class games. Kalyankrishna, who ended the season as their top wicket-taker with 30 wickets, will have to lead the bowling attack in absence of Sahabuddin. PUNJAB Punjab are one of the teams severely hit by the Indian Cricket League (ICL): as many as 11 players defected, not all starters but yet a significant chunk. Dinesh Mongia and Reetinder Singh Sodhi, their batting mainstays, are the biggest losses. From being runners-up in 2005 to securing just eight points in six games last season and then losing half the team to ICL, it has been a downhill ride for Punjab. Pankaj Dharmani, their captain who also keeps wicket, will have to take the added responsibility of leading the inexperienced batting line-up. He will happily accept all the help that comes from Ravneet Ricky, the opener who was a part of the world-champion Under-19 team back in 2000. There are a couple of young batsmen who have been doing well in CK Nayudu Trophy: Sumit Sharma, the 19-year-old who has played for India U19, and Ravi Inder, the Punjab U-22 captain. Karan Goel, the highest run-getter in the domestic Twenty20 last season, will look to carry that form into first-class cricket. The pace bowling, though, looks strong if VRV Singh can be at his best, in tandem with the workhorse Gagandeep Singh. They will be joined by the 18-year-old Amanpreet Singh, who took four Mumbai wickets on debut last season. Uncapped legspinner Sarabjit Ladda and the 6'4" seamer Manpreet Gony are also highly talked about. Punjab will play under a new coach this season, their third in three seasons. Gursharan Singh, who played one Test for India and also led Punjab to their only Ranji title in 1992-93, has taken charge of the team and is optimistic, even without those who have joined ICL. Punjab are pooled with last-year's runners-up Bengal and semi-finalists Baroda, but they play five of their six matches at home. Complete Punjab Squad What they did last year After securing a one-run lead in a low-scoring season starter against Bengal, they lost the match outright. In the second match, after dismissing Gujarat for 208, they couldn't force an outright result. Had they capitalised during these two matches, they could have made it to the semi-finals. They beat Mumbai on first-innings basis in a thriller in the following round, but all they could manage after that was two draws before losing another thriller. In their last match, against Hyderabad, they came within a wicket of winning outright, but Hyderabad just about held on to get the required 137 in the last innings. Individually Dharmani was prolific with 537 runs at 76.71, with three centuries. Luv Ablish was their highest wicket-taker, with 17 wickets at 23.47, but he will be playing in the ICL this year. Men to watch When both VRV Singh and Gagandeep are on song, they have the makings of being one of the most potent new-ball pairings in the Ranji Trophy. This will be an important season for VRV Singh, who has not been consistent at the international level. But it will be crucial how Dharmani and Ricky take charge of the young batting line-up. They have been consistent over the years, but this season will demand something extra. oh. i dont get neosports so hopefully someone here could get the highlights of the tournament. im interested in seeing manoj tiwary play. Hmmmm .... who is this second Yadav ? I don't get it either. Hence I'll be banking on Cricketics and Rajeev's highlight only, if my DTH refuses to bring Neo Sports by next month. Or I can watch a few interesting matches at my neighbour's place too. It is a medium pacer, Tapioca. But just can't say whether he is a relative of Shivlal Yadav or not! SuperSelector Update. Due to concerns raised by Chandan regarding the strict nature of being forced to select atleast 1 player from each team, I've relaxed the restriction somewhat to the following: Min from each team: 0 Max from each team: 3 You may change your teams. RAJASTHAN A disappointing 2006-07 season was a big setback for Rajasthan, struggling to gain recognition in the Super League. Recognising the need to spruce up the team's profile and fortunes, the Rajasthan Cricket Association (RCA) has hired the services of former India coach Greg Chappell and biomechanist Ian Frazer to coach youngsters at the new cricket academy, the Centre of Excellence. The experiment of recruiting foreign players - Vikram Solanki and Kabir Ali from England - didn't quite work out last season and the squad on this occasion lacks a bit of gloss, with Ajay Jadeja too missing from the list. Left-arm spinner Mohammad Aslam has been rewarded for his impressive performances last season with the captaincy, taking over from Jadeja. Complete Rajasthan Squad: Mohammad Aslam Captain Ravikant Sharma Robin Bist Nikhil Doru Shailender Gehlot Rohit Jhalani Wicketkeeper Rahul Kanwat Gagan Khoda S Mathur Pankaj Singh Vineet Saxena Shafiq Khan Prakash Kishore Sharma Rohit Sharma Another Rohit Sharma?? :hmmmm: What they did last season Beginning the season with a 138-run victory against Gujarat, Rajasthan's performance plunged so much that they finished at the bottom of the table in Group B. Gagan Khoda, their most experienced player, started off in the right note with centuries in back-to-back games, the second of which came in a drawn match against Hyderabad. However, the batting capitulated to embarrassing proportions against Maharashtra, where they folded up for 86 in the first innings and went down by an innings and 250 runs. A draw against Punjab was a saving grace, but that was followed by two consecutive innings defeats, against Mumbai and Bengal respectively. Jadeja's contributions were pale in comparison to that of his previous season, given that he positioned himself in the late middle-order. With just one outright victory out of six games, Rajasthan just about managed to avoid relegation. Solanki, usually on the fringes in England's one-day squad, finished with decent returns of 259 runs in five games, but didn't quite blaze away with three-figure scores as was expected of him, while Ali didn't quite acclimatise, managing just two games. Aslam and Pankaj Singh finished with 20 and 13 wickets respectively, while Khoda headed the run chart with 390 runs. Men to watch The most recognisable face in the line-up would be Pankaj Singh, the tall right-arm seamer who was picked for the India Green squad for the Challenger Trophy. Though not of express pace, he has the ability to utilise his height to get bounce and lift. Singh has experience with the India A squad as well, with impressive returns on the tour of Kenya recently. Among the relatively new faces in the squad, Rajasthan's newly-appointed coach KP Bhaskar has identified two talented Under-22 players in Robin Bist and Rajesh Bishnoi as the ones to look out for. Bishnoi, however, hasn't been included in the squad for the first two games, because of his U-22 commitments. Bhaskar said that one season would be too early to assess the influence of Chappell on Rajasthan's youngsters, and it will be interesting to see how the team takes to innovative exercises like boxing, rock climbing and commando training in the coming months. SAURASHTRA With a record that has veered from the middling to sloppy, Saurashtra have rarely made an impact in the Indian domestic circles. For long viewed as minnows who could be easily rolled over, Saurashtra are gradually establishing themselves as a side with surprise potential. Relying on budding talent, they have a bigger challenge ahead of them this time: all their games are away from home. They are one of the few sides without too many changes - none defected to the ICL - and as a seasoned observer pointed out, "nothing much has changed in Saurashtra in the last 15 years". Saurashtra will want Cheteshwar Pujara to continue last season's form. Complete Saurashtra Squad: Jaydev Shah Captain Jayesh Arashi Odebra Firoz Bambhaniya Bhushan Chauhan Rakesh Dhurv Sandeep Jobanputra Sagar Jogiyani Wicketkeeper Shitanshu Kotak Kamlesh Makvana Sandip Maniar Pratik Mehta Sandil Natkan Cheteshwar Pujara Nikhil Rathod Kanaiya Vaghela What they did last season They started poorly, conceding a first-innings lead against Uttar Pradesh, losing to Baroda and Andhra Pradesh and missing out on the lead against Tamil Nadu as well. A couple of inspired home wins against Delhi and Haryana, both engineered by handy left-arm spin from Rakesh Dhurv, provided plenty of cheer and they ended the season with a high-scoring draw against Karnataka. They will hope to get more out of draws - the inability to take the first-innings lead was a concern - and notch up tall totals on their travels. Their batsmen have usually adjusted well to the slow and flat nature of the Rajkot strip, but countering difficult conditions away would be the major challenge. Shitanshu Kotak and Cheteshwar Pujara - one an experienced hand, the other an emerging one - managed more than 500 runs each last year. Dhurv ended with an impressive 25 wickets, at an average of 21.60, and Sandeep Jobanputra, the new-ball bowler, complemented him with 21. Men to watch Pujara is probably the one closest to the getting on the national radar, that too only for the longer format. He has shone bright in the Under-19 levels and displayed the patience and all-round strokeplay to rack up big scores. Ravindra Jadeja, a left-arm spinner who fields athletically, could develop into a bits-and-pieces player in the one-day version. Dhurv and Kamlesh Makvana will lead the spin department. How is the quality of the competition in Ranji trophy these days? and is the set up any good? In Pakistan the Quaid trophy this year has no less than 23 teams separated in to 2 random groups, they have even mixed all the regional and departmental teams which makes for horrible competition. I do not think it is very good, Faisal. Indian Ranji Super League has 15 teams but even thats is too many. This doesn't encourage fierce competition and at least 5 or six of those 15 teams just fight for survival to avoid being relegated to the second rung. None of the sides have more than one or two decent players and some do not have even that. So I think there is plenty of room for development if only BCCI could turn its attention to domestic cricket too. This article will give you a good impression: Lost in translation: Why doesn't India's domestic cricket produce finished cricketers, ready for the highest level? November 2006: Gagandeep Singh is called "bowling machine" in Indian domestic cricket circles. By both his Punjab team-mates and opponents. If you have seen him bowl over after relentless over on unresponsive Indian tracks, you wouldn't wonder why. Even in the heat of March he can virtually bowl all day. And he doesn't just turn up and bowl; he gets a wicket every eight overs. December 2004 was a good time to be Gagandeep. In the four matches of the 2004-05 season till then, he had taken 28 wickets. He had been the leading wicket-taker in the previous season's Ranji Trophy, and had 45 first-class wickets at 18.46 in all. At 23 he had forced his way into the Indian team on tour to Bangladesh. Five years of hard work in dreary domestic cricket had paid off. October 2006 is not a good time to be Gagandeep. He came back from that Bangladesh tour not having played a game. In July 2005 he attended a national conditioning camp as one of the 36 best available Indian players, but has since been forgotten by the selectors. He has seen Under-19 fast bowlers come and usurp his position on the fringe of the national side. In 2004-05 he finished with 48 wickets at 18.10. The next season he took 32 at 19.09, but he is no longer part of India's future, it seems. He feels already that his time is almost gone. "This year is very crucial. In two years' time another Under-19 batch will come up," he says. "First-class performances, as it is, don't matter as much as Under-19 nowadays. After 27-28, selectors stop looking at you." For a contrast, take a look at Australia. The last year was hard for them. They lost the Ashes, and changes were being called for in a team where the average age was over 30. In waltzed Hussey, 30 years and 164 days old, and a veteran of 15,313 first-class runs. Seamlessly he fit into the side and became the fastest ever to 1000 Test runs. It took 29 matches for his one-day average to drop below 100, and his strike-rate still hovers around that figure. He now averages 70-plus in both forms of the game, and is considered a threat to Ricky Ponting's captaincy. He is not an exception. Four months after Hussey's debut, when Glenn McGrath pulled out of the South Africa tour to tend to his ailing wife, his place was taken by Stuart Clark (30 years and 168 days), who ended up Man of the Series with 20 wickets at 15.85. And there have been many before them: Simon Katich, Stuart MacGill, Adam Gilchrist, Justin Langer, Darren Lehmann, Michael Kasprowicz, Brad Hogg, Matthew Hayden, Damien Martyn - it's a long list. Moral of the story: for Indian cricketers 25 is over the hill; for Australians it's only the beginning. For Australia it is a triumph of the system; in India's case it is testimony to the absence of a system. Australia look for the finished product, players who have gone through the grind, been hardened by competition, and are ready to plunge into international cricket. India search for precocity, a spark, and hope it can survive the cauldron. When asked if Suresh Raina wouldn't be better served if he spent a couple of years in domestic cricket, a senior member of the Indian team asked: "For what? To rot?" In recent years the U-19 league, and not first-class cricket, has become the feeder system for the Indian national team, and 23 seems to have become the upper limit for making it. Ramesh Powar in one-dayers and Aakash Chopra in Tests, have been the only players above 25 to have made their India debuts in the last few years. Chopra has since been discarded, while Powar holds on. Nayan Mongia was the last player to have enjoyed a successful run in international cricket after making his debut at 25. Sanjay Bangar, who played his first international match at 29 was India's oldest debutant in many years, and Robin Singh made a comeback at 33. But they are exceptions. Over the last five years 22 players under the age of 25 have made international debuts for India. Fourteen of them were 21 or less, and two under 18. Only seven players over 25 have made debuts over the same period. On the all-time list of youngest Test debutants, one has to scroll down to 19th position to find an entry that is not from India, Pakistan, or Bangladesh. Nine of the 10 youngest centurions come from these countries. The reason isn't hard to find. The system doesn't produce cricketers in India. Wasim Jaffer probably knows it best. He made his debut against South Africa eight days after his 22nd birthday, after three impressive domestic seasons, the first of which included a triple-century in only his second game. But Allan Donald and Shaun Pollock were in an altogether different league from the bowlers he had faced till then. "The gap between first-class cricket in India and international cricket is just too much," he says six years later, after having made a comeback to the national side. "Australia have only six first-class teams. That means only about 70 cricketers, while we have some 300. It's tough for players to keep improving in this set-up." VB Chandrasekhar, a former national selector, has a slightly different view. "You have to work with what is available. And our domestic cricket is definitely not of the highest standard," he says. "Plus, when we pick a player, as selectors we want to look at someone who will come and stay for 10 years. When you bring in somebody, it is always better to get someone who is younger, likely to stay, learn, and contribute for 10 years." Not that players from domestic cricket are completely overlooked. At 31, Railways cricketer JP Yadav's international career was almost over when he was picked for the Zimbabwe tour in 2005. "I had taken around 60 wickets and scored around 600 runs in first-class cricket that season. So it was like saying, 'I dare you to keep me out' to the selectors," he says. "You can't ignore anybody like that," says Chandrasekhar. "The only thing is, they don't catch up. He [Yadav] didn't do badly but didn't come and take Indian cricket by storm, which is what we expect when we pick somebody. Or we expect to have them deliver at some point of time, like Raina." Yadav is now out of the national side. And Railways have been relegated to the Plate group of the Ranji competition, which makes his domestic performances even more insignificant. 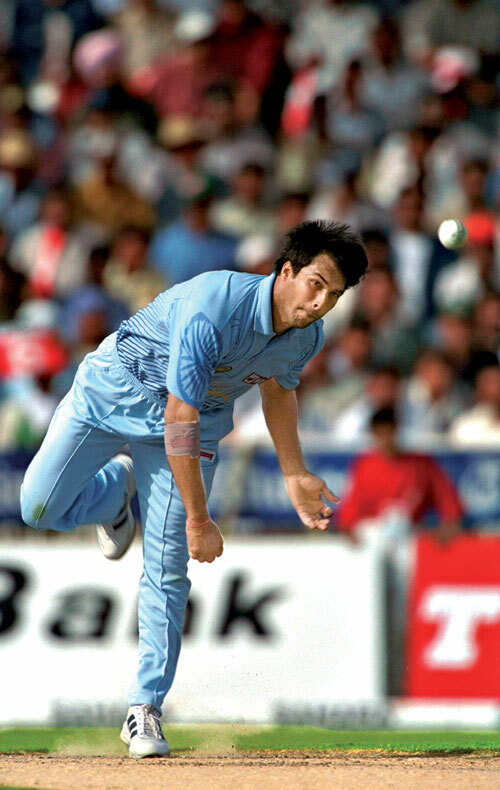 Robin Singh's exceptional fitness worked in his favour when he made his comeback at the age of 33 Â© Getty Images What worked for Robin Singh when he made his India comeback in late 1996? He had taken 29 wickets and scored 443 runs the previous season? "There is no comparison between Robin and anybody else," says Chandrasekhar, "He was supremely fit. He is still fit. Fitness does play a big role. "Domestic cricket is played over a period of four months in India. It's not a year-round activity, so it's difficult to keep the fitness up. Maybe the training methods are changing. Maybe now we would have guys at 28-29 who are still strong and fit, but it hasn't always been the case." Amol Muzumdar will be 32 this month. He has been playing for Mumbai for 13 years and is a mainstay of their Ranji line-up. He averages 51.17 in first-class cricket. He was marked out as an India prospect when he scored 260 on his first-class debut in 1993-94 - still a world record. Today he is reconciled to never having made it into the national team. His initial years coincided with the strongest Indian batting line-up in a long time. 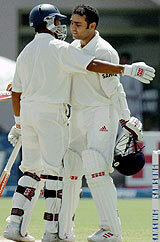 Sachin Tendulkar and Mohammad Azharuddin were already in, and Rahul Dravid and Sourav Ganguly arrived in 1996. "I was competing with the real dadas of Indian cricket,'' he says, without rancour. "Those days I was trying to figure out where I would fit in." But the fact is that when vacancies arose in the Indian team, Muzumdar, though a regular in the Mumbai side, was nowhere in the frame. By the reckoning of one of his own colleagues, the years put in on the domestic circuit hadn't made him a better player: "By then he had stagnated. In terms of skills he was where he had started." The lack of security didn't help. "After eight years of playing first-class cricket for Mumbai, I didn't have a job," Muzumdar says. "Compare our scene with Australia," says Gagandeep. "In cricket, and in life, they have many more securities. We are prone to giving up more easily if the chance doesn't come our way. Four-five years is what we can go on for. If we don't get a chance by then, it's very hard to keep the motivation up." Gagandeep can't be blamed if he, or someone else like him, gives up at 25 and starts preparing for a life in domestic cricket without a higher goal motivating him. "Selectors very easily build rigid views about such players. They think a certain player is good for domestic cricket only," says Yadav. But it is difficult to reconcile with it when you are still strong and think you can make it but know you won't. "It is also more of an individual thing," says Jaffer, "to stay motivated when you see your performances get less weightage than [those of] an U-19 guy." Chandrasekhar cites the case of Raina, who didn't exactly take Indian cricket by storm in his first few matches. Raina had turned in good performances in Under-19 cricket, and was chosen for a probables camp, where he impressed the coach and the captain. After 15 one-dayers without a fifty, he was chosen for the Test team against England, although he didn't make it to the XI. "The idea is, once you see a spark, you want them to straightaway get used to the rigours of international cricket," Chandrasekhar says. "I made my India debut when I was 27. I made one solid effort to come back. After that I knew it was going to be very difficult. That's probably why you want to have somebody who is young and can be given a long rope, not someone who is 29." When she won another Grand Slam at close to 50 years of age, people asked Martina Navratilova how she could keep up with and beat players half her age. She said, "The ball doesn't know how old I am." Navratilova's big advantage was that she never moved away from top-level tennis - even if she didn't play singles, she kept playing doubles with some of the finest players of both sexes. Top-level competitive cricket is a luxury Indian domestic cricketers are not afforded. And when an opportunity comes, they let the ball know how old they are - and a few other things about their first-class cricket besides. -------------------------------------- And I agree ,mostly agree with the article! isn't this an old article chandan.. i remember reading it last year.. I think Arjun yadav is shiv lal's son. think nahi,, pakka he is shiv lalz son with mediocre average.. he was selected for africa tour to play for India a.. I think the super league should be reduced to 8-10 teams only. This following league would be as tough as any other div I team in Conty cricket: Mumbai Baroda Delhi Punjab Karnataka Tamilnadu Hyderabad Bengal Add U.P and Railways. I like the Zonal System though.. u divide team in 4 groupz, east, west, north, south.. only thing is that we don't get to see enough playerz in that as only 4 teamz...but then competition is good too.. Some of the guys who left AP team for ICL ....cited the partiality towards this shiv lal's son as thereason for their leaving. i think all the members here should be told to pick their XVI for Ranji matches.. we must know..who is doing what in domestic matches..and this way ranji matches will generate interest here on this forum as well..
yeah..but how many have selected their respective teams there..in Ranji SS..there is hardy 9-10 entries..
Where do we submit the teams? go to games.. then super selector.. just like the way we playing Indo-pak super selector.. same way we r having Ranji selector.. varun set it up yesterday only.. Thanks chandan and varun.... Nehra is playing? I do not think it is very good, Faisal. Indian Ranji Super League has 15 teams but even thats is too many. This doesn't encourage fierce competition and at least 5 or six of those 15 teams just fight for survival to avoid being relegated to the second rung. None of the sides have more than one or two decent players and some do not have even that. So I think there is plenty of room for development if only BCCI could turn its attention to domestic cricket too. ! thanks for the article Chandan. Seems like the whole structure will take time to improve. May be it's better to bring the young and talented cricketers straight in to the national team or the A team because the domestic cricket isn't going to help them much. That's why i am bit surprised that even though PAK have won the last 2 under 19 world cup yet none of those youngsters have been given a consistent chance at the international level. Actually they aren't good enough, Faisal. India-Pakistan have always been champions at the age levels but they are ultimately not good enough at the international level because the finishing school, our domestic cricket, is extremely poor. Players are unable to hone their skills to take it to a higher level whereas, Australians are average at the age group but due to the terrific system that they have and with correct guidance at various stages, they go forward while Indians and Pakistanis get lost unless they are exceptional talents! Quite a number of factors work here. India has 27 FC teams which makes it about 375 FC cricketers. Hardly 60-70 of them good and offer some competition to the better budding challenges. If there would be no challenges, how will the bud blossom? What'll be the rigours which helps him prepare for the tough field which is international cricket? How will he become a finished article to be able to offer something substantial to his country? Then, the pitches prepared for these matches aren't very good, the ground is not good enough to encourage good fielding,umpiring is poor, support staff is scant, there is no goal, no guidance and the path is equally hotch-potch!! So, if India aims to be the top team, it has to improve its FC structure first. Didn't you read that article in the first page, Radhika? Anyway, here are the final two teams of group A: MAHARASHTRA Venugopal Rao will lead Maharashtra in the absence of Sairaj Bahutule Maharashtra has one of the most professional set-ups in Indian domestic cricket; with central contracts for players, a shrewd and previously successful coach in Chandrakant Pandit, a clear vision of developing home-grown players with the assistance of professional imports, and a yearning to play at smaller centres. It is a misfortune though, that they face the tough task of starting the Ranji Trophy with 10 uncapped players in their squad. Ten new faces in Maharashtra squad Maharashtra's squad for their first Ranji Trophy match, against Tamil Nadu, features 10 uncapped players and a new captain, Venugopal Rao, who played for Andhra during the 2006-07 season. They find themselves in this predicament partly because of the exodus to the Indian Cricket League (ICL) and partly because Sairaj Bahutule and Hrishikesh Kanitkar are not match-fit. The team and the captain, according to Pandurang Salgaonkar, the chairman of selectors, are chosen only for one match. Bahutule, their captain last season, had to undergo shoulder surgery while Kanitkar had an operation on the knee. The Maharashtra selectors were not sure of their match fitness and they will make further decisions only after the first match.Apart from the two, S Sriram and Dheeraj Jadhav have moved to the ICL, leaving them with a depleted side. Venugopal Rao, the Andhra captain last season, has moved to Maharashtra and has been named the captain for the first match. It hasn't yet been decided who will lead the side when Bahutule is back. Rao will be the batsman that Maharashtra will look up to, with only Yogesh Takawale and Harshad Khadiwale having any experience at this level - that too for one season. Maharashtra have been following the policy of blooding homegrown youngsters, along with senior professional imports over the last two-three years. Rao, who has played 16 ODIs for India, will be expected to bolster the inexperienced batting line-up. The bowling attack will be led by Munaf Patel and Shrikant Mundhe, who played for India Red in the recently concluded Challenger Trophy. They will look for inspirational bowling from Munaf Patel, who will be eager to earn a recall to the national squad. Yogesh Takawale, who played as a batsman last season and scored 351 runs at 50.14, will replace Satyajit Satbhai's as wicketkeeper. Venugopal Rao and Munaf Patel will be the senior pros for Maharashtra this season They will be coached by Chandrakant Pandit, fresh from a successful stint as India A coach on their tour to Zimbabwe and Kenya. Complete Maharashtra Squad:Venugopal Rao (capt), Munaf Patel, Dhruv Mohan, Yogesh Takawale (wk), Harshad Khadiwale, Salil Agarkar, Kedar Jadhav, Shrikant Mundhe, Digamber Waghmare, Swapnil Gugale, Ashish Suryavanshi, Vishant More, Samad Fallah, Vishal Bhilare, Sayyed Wahid. What they did last season They would have wanted more than the seven points they scored from six games, especially after they had posed a threat to big teams in 2005-06, securing an outright win against Mumbai along the way. 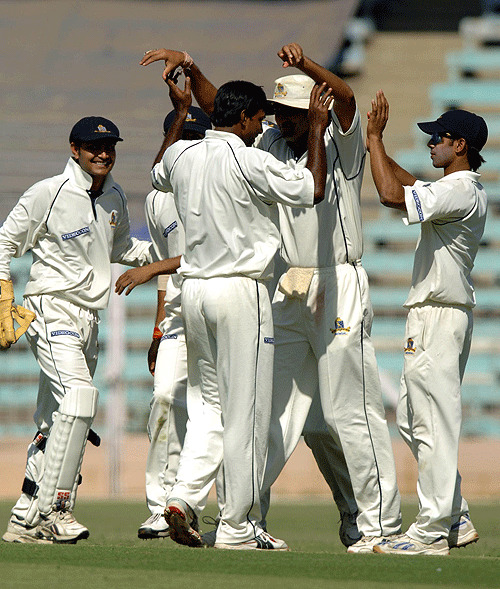 Their 2006-07 campaign started with a dull draw against Hyderabad, but in the next match, they walloped Rajasthan by an innings and 250 runs in Ratnagiri. Then, in a high-scoring draw, they ended up 98 short of Punjab's first-innings total of 550. They were on the wrong side of a draw once again when Bengal bowled them out for 215 and scored 325. In their penultimate match they let Gujarat score 369, and the maximum they could get was two points, which they did by putting up 450 runs. In their final match, Maharashtra were defeated by Mumbai, who extracted revenge for last season by defeating them by an innings and 154 runs to ensure a clear semi-final path. Kanitkar ended up with 503 runs at 71.85 and Sriram scored 424 at 70.66. Takawale was the surprise package with 351 runs in seven innings. Men to watch Munaf and Rao will obviously have to shoulder most of the responsibility at the start of the season. Once Bahutule and Kanitkar are fit, they should make a fairly competitive unit. Takawale, who played as a batsman only, will be the keeper this season as Satyajit Satbhai has been dropped after an ordinary season. HIMACHAL PRADESH Himachal Pradesh made their way up to the Ranji Super League after they beat Railways by seven wickets on the final day of their Plate League semi-final in Dharamsala. Then they brushed aside Orissa, who also qualified to the next division, by nine wickets in the final. The winning formula was simple - everyone contributed. The top order batsmen all scored runs and the bowlers, led by talented left-arm spinner Vishal Bhatia, did enough to ensure HP didn't lose a game last season. Former India offspinner Sarandeep Singh's move from Punjab to HP proved successful as his 28 wickets and useful runs down the order indicate. Young players such as wicketkeeper Maninder Bisla, Paras Dogra and Manish Gupta were crucial last season, but the competition will be much tougher this year. How these youngster adapt, and how they are led by the seniors, will determine HP's fortunes. Complete HP Squad What they did last season HP topped the Plate League Group B table with 13 points as a result of two wins and three draws. They opened the season with a 342-run win over Jharkhand, based on an all-round effort. Sarandeep led a spirited fightback with a five-for after they had conceded the first-innings lead to Orissa in the next game at Dharamshala, but it proved to have come a bit too late in the day. In the next game, a draw against Tripura at home again, a Bhatia-inspired HP moved to the top of the Group B table and followed it with a thumping win over Jammu & Kashmir by an imposing innings and 75 runs at Jammu. With that win, they ended joint leaders with Orissa in Group B. They expectedly earned two points from the drawn encounter in Delhi, but were unable to force a result on the final day. Nevertheless, they were in the semi-finals, where they beat Railways by seven wickets. HP cruised to the Plate Group title after they kept Orissa to 317, put up 477 in their first innings, and shot Orissa out for 216, before rattling off 58 in 9.4 overs. Dogra was HP's best batsman with 528 runs at 48, with two hundreds, while Bhatia was the highest wicket-taker in the Plate League, with 38 scalps. Men to watch The 25-year-old Bhatia would look to carry on with his form. His contributions last season were key to HP's doing so well; his 6 for 71 helped dismiss Orissa and a further six-wicket haul a week later mopped up Tripura's tail as HP moved to the top of the Group B table. His eight wickets set up a big win over Railways and a fourth six-wicket haul helped spin HP to the title win. Sandeep Sharma, the experienced captain, enjoyed a successful 2006-07 season with the bat and will be expected to do the same this season, as the stakes get higher. Ok. So here are the final 3 teams in group B. I hope people will have a fair idea of the teams and competition after reading about all the 15 teams! :D UTTAR PRADESH Champions one season and fighting relegation the next, over the last two seasons, Uttar Pradesh gave Pakistan a run for their money in terms of unpredictability. What's in store this season? A tournament that they start without their key pace bowlers: Shalabh Srivastava who has moved to ICL, and RP Singh and Praveen Kumar, who are a part of the Indian team as of now. Ashish Winston Zaidi, their manager this season and the canny pro with the ball, retired last season and there is a void left in the bowling department. Mohammad Kaif will lead a new-look Uttar Pradesh team in the Ranji Trophy and Suresh Raina will be the vice-captain. UP go into the season without left-arm seamer Shalabh Srivastava, Ali Murtaza and Avinash Yadav, who have all joined the Indian Cricket League (ICL). Srivastava has been a consistent performer for UP over the last few years. Moreover, the experienced trio of Rizwan Shamshad, Ashish Winston Zaidi and Gyanendra Pandey retired from first-class season last season. Pandey will coach the side this season, and Zaidi will be the team manager. Left-hand batsman Shivakant Shukla, left-arm spinner Praveen Gupta, and wicketkeeper Amir Khan, who were all tipped to join Railways this season, have chosen to stay behind and are all selected. There is a freshness to the batting line-up, with captain Mohammad Kaif and vice-captain Suresh Raina leading a young line-up. Gyanendra Pandey, their coach this season, and Rizwan Shamshad, the middle-order veterans, also retired last season. Tanmay Srivastava, who has impressed with India Under-19, Ravikant Shukla, former India U-19 captain, and Shivakant Shukla are exciting young prospects for them. The bowling in the absence of RP Singh and Praveen Kumar, both representing India, and Srivastava, is without a spearhead. The spin department looks good with Piyush Chawla and left-arm orthodox Praveen Gupta, but the bowling still is a fickle unit. If Kumar and Chawla are available to play, they look a respectable attack, but without them it should be a struggle for them. For Piyush Chawla, the first few matches will be crucial as he would look to draw his way back to the Indian team. They play only one game at home this season, which could be a blessing in disguise because most of the wickets in UP encourage draws. Complete UP squad : Mohammad Kaif (capt), Shivakant Shukla, Ravikant Shukla, Tanmay Srivastava, Piyush Chawla, Amir Khan (wk), Rohit Prakash, Rahat Ilahi, Ratnesh Mishra, Praveen Gupta, Suraj Pratap Singh, Sudeep Tyagi, Tahir Abbas Reserves: Parvindar Singh, Anshul Kapoor, Raj Singh and Abhishek Tiwari What they did last season Neither their batsmen nor their bowlers ever hit their straps last season, struggling to put up big, sufficient-to-bat-once totals with the bat, or running through the opposition with the ball. After a first-innings lead against Saurashtra, a points-less draw and an outright loss, the low point came in the away match against Haryana when they were bowled out for 71. Following that innings defeat, they just about hung on for two points against Tamil Nadu, who after having fallen behind in the first innings, set UP 129 to win in 25 overs. A positive start was followed by a collapse and at seven-down, Rohit Prakash and Shivakant batted out 7.3 overs to ensure a draw. After being outplayed by Baroda, they had only four points from six games and were one false step from emulating Railways by getting relegated in their title defence. In their last match, they put up an inspired show in beating Andhra by an innings and staving off what would have been a humiliating descent to Plate League. Men to watch Kaif will know a big season with the bat will do him no harm and so will Raina. Two seasons ago, along with Kumar and Shalabh, they were the main architects of UP's revival from a hopeless situation mid-season. Shalabh is out, Kumar may or not be available - the same can be said of Raina and Chawla. And with other seniors retired, this is the season for any of the young brigade to stand up and make his presence felt. Tanmay, Ravikant and Shivakant will want to take up more responsibility this season. ORISSA Ever since they were relegated to the Plate League in 2002-03, they had made it to the semi-finals of the Plate League each year, but somehow never crossed that barrier. Last season though, they reversed the trend by defeating Assam to enter the final and earn a right to play in the Super League in the 2007-08 season. Veterans Debasis Mohanty and Shiv Sunder Das are the two most recognisable faces in the team, whose performances usually revolve around the two. Das and Niranjan Behera, who played the Challenger Trophy this season, are the two main batsmen in the top order. Captain Pravanjan Mullick, who can double up as a handy medium-pace bowler, provides the stability to the middle order. Mohanty got enough help last season from new-ball partner Sukanta Khatua and offspinner Sanjay Satpathy. Behera and Mullick with their part-time stuff give the bowling line-up an efficient look. Complete Orissa Squad What they did last season Their reversal in the semi-final was the pinnacle of their performance, especially Mohanty's nine-wicket haul. After he had reduced Assam to 235 in the first innings, he saw his side fall short by two runs. But in the second innings, with figures of 4 for 43, he bowled Assam out for 120, setting up an easy target. They couldn't keep up the intensity in the final and lost to Himachal Pradesh by nine wickets. The other highlight for Orissa came in their last league match when Das hit the first triple-century in the Ranji Trophy since 2000-01. They also gained a first-innings lead in each of their matches, and an innings win against Tripura to boot. Men to watch Das and Mohanty will obviously be the ones to carry them in the big league. But Behera showed a lot of promise last season. His 509 runs at 50.90, the sixth-highest aggregate in the Plate League, were instrumental in Orissa's ascent to the Super League. With the big boys in the Twenty20 matches, he sneaked into the top-10 in both the batting and bowling charts. Khatua, in his second season, got 16 wickets at 15.12 last season and could be one to watch out for this season too. BARODA Fierce inter-club rivalry, good infrastructure - there are seven cricket grounds in one city - and flow of talent, has seen Baroda become a solid Ranji team. Their semi-final appearance last season was their second in a row. And they managed this despite Irfan Pathan's selection to the India squad and Zaheer Khan's to Mumbai. But their bowling attack for this season has been depleted after losing seamer Rakesh Patel to the ICL. This means that Irfan Pathan Snr will have to shoulder more responsibilities in the fast-bowling department. Yusuf Pathan and Rajesh Pawar, the spinners, got higher honours - Pawar was selected to the Test squad on the tour to Bangladesh, while Yusuf played in the final of the ICC World Twenty20. Their batting line-up last season was led by senior batsmen Jacob Martin and Connor Williams. Baroda are yet to announce their squad because they play their first match only in the second round, which is a good 15 days away. They will be coached by Paras Mhambrey, who has previously coached Bengal to two successive Ranji Trophy finals. What they did last season Along with Bengal, they were the most consistent teams in the Ranji Trophy last season. They led their group going into the semi-finals. In the semi-finals, they had Mumbai down at 0 for 5, but somehow let them off the hook. Their campaign last season started off with a bang when they bowled Karnataka out for 85 on the first morning and won the match by seven wickets. They followed it up with a clinical dismantling of Saurashtra by an innings and 19 runs. They folded for 244 in Delhi and conceded a first-innings lead. They were in danger of playing out an average season after an exceptional start, after narrowly missing a first-innings lead against Andhra. Two solid performances followed and after outright wins over Haryana and Uttar Pradesh, they sat on top the points table with four wins, which was more than any other team. Then came an outright loss to Tamil Nadu against the run of play, which took away the momentum going into the semi-finals against Mumbai, where a first-innings collapse for 142 hurt them even though they bowled them out for 145 in the second. Men to watch Pawar, the fourth-highest wicket-taker last season with 36 wickets, is the key member of the team with his left-arm spinners expected to have an impact. Among the batsmen, apart from Williams and Martin, Baroda will look for a good season from Pinal Shah, the wicketkeeper-batsman, who had an average season with the bat last year but is an aggressive middle-order batsman. So the most anticipated Ranji match is to beging tomorrow. KARNATAKA-MUMBAI RANJI TROPHY: The following news is from Karnataka's point of view. Focus on Rahul Dravid, KumbleMumbai, Nov 2 (PTI) The former India skipper, omitted from Indian team for the first two ties against Pakistan in the upcoming five-match rubber, will play under another stalwart Anil Kumble to give their state team a look of class... Rahul Dravid gets a great chance to rediscover his golden touch with the bat when he turns out for Karnataka in their lung-opening Elite Division Group A Ranji Trophy tie against holders Mumbai starting here tomorrow. The former India skipper, omitted from the Indian one-day team for the first two ties against arch foes Pakistan in the upcoming five-match rubber, will play under another stalwart Anil Kumble to give their state team a look of class against the 37-time winners and hosts in the four-day league tie. The first class game at the Wankhede Stadium is the ideal stage for Dravid, who had a lean time with the bat in the seven-match ODI series against Australia which concluded on October 17, to get among the runs ahead of the tough battles ahead in the season, including the three-Test rubber against Pakistan which follows after the conclusion of the ODI series. The last time "The Wall" had turned out for Karnataka in Ranji Trophy was at Rajkot for last season's league clash against Saurashtra. Also keen to get into the groove for the Test series along with Dravid would be Kumble, who would be playing his first Ranji tie for Karnataka in two seasons and his opening competitive long-duration tie after returning home from England at the end of the Test series in August. The ace leg spinner has turned out for the All Star team in the Sixes event at Hong Kong, but had played little else since India's last Test rubber. The visitors would be banking a lot on this duo, as well as on another seasoned and ex-India campaigner Sunil Joshi, with back-up from the younger lot to get off to a good start against Mumbai. "The youngsters in the team can learn a lot by sharing the dressing room with Rahul and Anil whose perseverence is to be appreciatated. They are still going strong after such a long career," the Level III coach said. Kumble said ahead of the tie that Karnataka would like to make a winning start to the tie. Recalling Karnataka's surge into the semis last season with a young team, Kumble said it was important for the team to get a good start to their campaign. "I am looking forward to this game. It will be nice to get things going in the first game itself". "The important factor is to ensure Karnataka gets off to a good start. We did well last season getting to the semi finals with the kind of team we had," he said. The visitors have a very good spin attack in Kumble, left arm Joshi and off spinner C Raghy and the key to Mumbai's fortunes might lie in how they tackle the Karnataka trio on a wicket that Bharadwaj expected to offer turn and break as the match progressed. The hosts too want to start with a gallop unlike last yea when they were without a point to their credit after three away games. "This time we want to start well and we have an advantage playing at home. It's also a great thing that our players woul be up against Rahul and Anil as a good show against them would give them a lot of confidence going forward," Mumbai coach Praveen Amre said. Mumbai too have in their ranks two India ODI discards, Ajit Agarkar and Ramesh Powar, who will be keen to get among the wickets along with pacer Avishkar Salvi who looked set for a career at the highest level till a shoulder injury prior to the last visit to Australia stymied his progress. The result of the battle between Agarkar, who reserves his best in longer duration games for Mumbai, and Dravid would be an important factor in the course of the match. Wasim Jaffer would be another player from the hosts' ranks who would view the tie and the subsequent ones as tune-ups for the Test series against Pakistan. The Test opener batted at number three in Mumbai's clash with Karachi Urban team of Pakistan in the Nissar Trophy tie, but will open in the Ranji tie with Sahil Kukreja, according to Amre. "Ajinkya Rahane, who opened in Karachi, will come in at number three," the Mumbai coach said, adding the choice of the last man in the final eleven tomorrow lies between an extra batsman and a seamer. Teams (from) Mumbai: Amol Muzumdar (Capt), Ajit Agarkar (vice capt), Wasim Jaffer, Sahil Kukreja, Ajinkya Rahane, Prashant Naik, Abhishek Nair, Ramesh Powar, Vinayak Samant (wk), Avishkar Salvi, Rajesh Verma, Iqbal Abdulla, Karnataka: Anil Kumble (Capt), Rahul Dravid, Barrington Rowland, K B Pawan, K Yere Goud (vice-capt. ), C Raghu, V S Thilak Naidu, B Akhil, Sunil Joshi, R Vinay Kumar, N C Aiyappa, Sudhindra Shinde, Devraj Patil, K P Appanna and S Dhananjay. Umpires: K Hariharan and A Chaudhary (both Delhi). Match Referee: Raju Mukherjee (Bengal). Newly appointed Karnataka coach and ex-ODI player Vijay Bharadwaj today said the presence of the star duo would certainly be a big plus for his team against an opposition of the calibre of Mumbai. ----------------------------------------------- Now the news from Mumbai point of view: http://www.expressindia.com/news/cricket/fulliestory.php?content_id=234123 Mumbai scanning Dravid’s weak spots mumbai, october 30: From the time Rahul Dravid was named in the Karnataka squad for the season-opening Ranji Trophy game against Mumbai, there has been an air of nervous anticipation at Wankhede Stadium. Mumbai coach Praveen Amre knows that Dravid will be keen to make an impact in his first game, starting November 3, after being sidelined from the national squad, but he says that he is working on a plan to stump the premier batsman in the rival camp. “We have been trying to get the recent footage of Dravid’s innings to study how he has been losing his wicket. We will sit with our bowlers and work out a plan,” says Amre. The former Test player adds that the job wouldn’t be easy. “Probably the only advantage we have is Dravid is not in form right now,” he says. But looking at the bigger picture, Amre is of the view that the likes of Dravid and Anil Kumble — who will be leading Karnataka—playing domestic cricket is great for the game in general. “By merely watching players like Dravid and Kumble there is a lot to learn for youngsters. Just imagine the likes of Ajinkya Rahane playing Kumble or Iqbal Abdulla getting an opportunity to bowl to Dravid. This match will be a learning experience for the youngsters,” says Amre. The Mumbai coach is of the view that his players have an edge over their rivals since they have got vital match practice before their first Ranji game. “We played the Mohd Nissar Trophy first and later Irani Trophy so the players in good shape,” he said. Interestingly, like Dravid there are two seniors in the Mumbai squad who are planning a comeback. Ajit Agarkar and Ramesh Powar, both dropped from the national side, will be keen to come good. Ironically, these bowlers will have vital roles to play when Amre works out a plan to stop Dravid after sitting with the team’s video analyst. --------------------------------------------------------------------------- Let us hope that Dravid, Kumble, Jaffer, Agarkar, Powar--everyone gets into his groove in tomorrow's match. In my opinion, it'll be just a walk in the park for Karnataka because I just can't imagine young Mumbai batsmen standing up to Kumble's bowling! hope karnataka bat first tomorrow..